Jeanne Antoinette Poisson, Marquise de Pompadour ( 29 December 1721 – 15 April 1764), commonly known as Madame de Pompadour, was a member of the French court and was the official chief mistress of Louis XV from 1745 to 1751, and remained influential as court favourite until her death. She took charge of the king’s schedule and was a valued aide and advisor, despite her frail health and many political enemies. She secured titles of nobility for herself and her relatives, and built a network of clients and supporters. She was particularly careful not to alienate the Queen, Marie Leszczyńska. 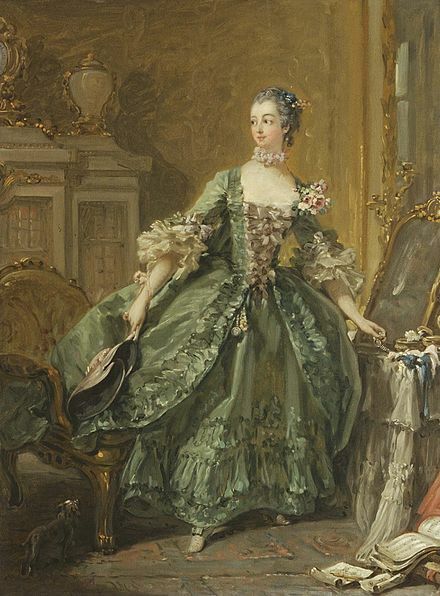 On February 8, 1756, the Marquise de Pompadour was named as the thirteenth lady in waiting to the queen, a position considered the most prestigious at the court, which accorded her with honors. Pompadour was a major patroness of architecture and decorative arts, especially porcelain. She was a patroness of the philosophes of the Enlightenment, including Voltaire. Hostile critics at the time generally tarred her as a malevolent political influence, but historians are more favorable, emphasizing her successes as a patroness of the arts and a champion of French pride. Art historian Melissa Hyde argues that the critiques of Pompadour were driven by fears over the overturning of social and gender hierarchies that Pompadour's power and influence, as a woman who was not born into the aristocracy, represented. At age 5 Jeanne Antoinette was sent to receive the finest quality education of the day in an Ursuline convent in Poissy, where she gained admiration for her wit and charm. Due to poor health, thought to be whooping cough, Jeanne Antoinette returned home in January 1730 at age 9. During this time her mother took her to a fortuneteller, Madame de Lebon, who predicted that the girl would one day reign over the heart of a King. Henceforth she became known as “Reinette”, meaning "little queen", and was groomed to become the mistress of Louis XV. Tournehem arranged for Jeanne Antoinette to receive a private education at home with the best teachers of the day who taught her dancing, drawing, painting, engraving, theatre, the arts, and the ability to memorize entire plays. It may have been this sponsoring of Jeanne Antoinette's education in particular that sparked rumors of his paternity to Poisson. 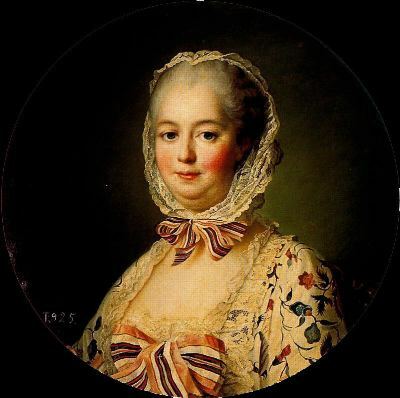 At the age of nineteen, Jeanne Antoinette was married to Charles Guillaume Le Normant d'Étiolles, the nephew of her guardian, Charles Le Normant de Tournehem, who initiated the match and the large financial incentives that came with it. On 15 December 1740, Tournehem made his nephew his sole heir, disinheriting all his other nephews and nieces, the children of his brother and sister. These included the estate at Étiolles (28 km south of Paris), a wedding gift from her guardian, which was situated on the edge of the royal hunting ground of the forest of Sénart. Once married, Le Normant d'Étiolles fell passionately in love with his wife, whilst she maintained that she would never leave him – except for the King. The couple had a son who died in infancy and a daughter, Alexandrine Le Normant d'Étiolles, born in 1744, who died at the age of nine. Jeanne Antoinette’s marital status allowed her to frequent celebrated salons in Paris, such as those hosted by Mesdames de Tencin, Geoffin, du Deffand, and others. Within these salons she crossed paths with principal figures of the Enlightenment, including Voltaire, Charles Pinot Duclos, Montesquieu, Helvétius, and Bernard de Fontenelle. Additionally, Jeanne Antoinette created her own salon at Étiolles, which was attended by many of the cultural elite, among them were Crébillon fils, Montesquieu, the Cardinal de Bernis, and Voltaire. Within these circles she learned the fine art of conversation and developed the sharp wit for which she would later become known at Versailles. Due to her involvement in Paris salons as well as her grace and beauty, Louis XV had heard the name of Jeanne Antoinette mentioned at court as early as 1742. In 1744, Jeanne Antoinette sought to catch the eye of the King whilst he led the hunt in the forest of Sénart. Because she occupied an estate near this location she was permitted to follow the royal party at a distance. However, wanting to attract the King’s notice, Jeanne Antoinette drove directly in front of the King’s path, once in a pink phaeton, wearing a blue dress, and once in a blue phaeton, wearing a pink dress. The King sent a gift of venison to her. Though the King’s current mistress, Madame de Châteauroux, had warned off Jeanne Antoinette, the position became vacant on 8 December 1744 when Châteauroux died. On February 24, 1745, Jeanne Antoinette received a formal invitation to attend the masked ball held on February 25 at the Palace of Versailles to celebrate the marriage of the Dauphin Louis de France to Infanta Maria Teresa of Spain (1726–46). It was at this ball that the King, disguised along with seven courtiers as a yew tree, publicly declared his affection for Jeanne Antoinette. 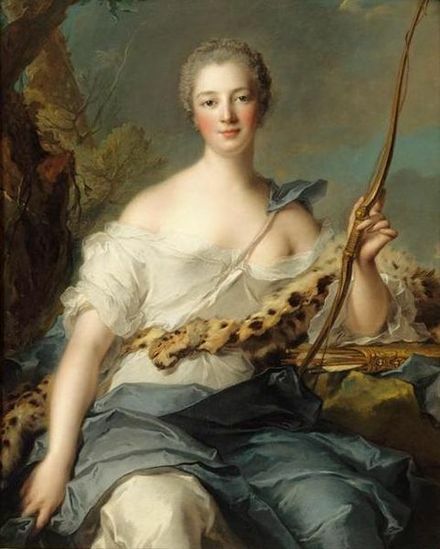 Before all of court and the royal family, Louis unmasked himself before Jeanne Antoinette, who was dressed as Diana the Huntress, in reference to their encounter in the forest of Sénart. By March, she was the king's mistress, installed at Versailles in an apartment directly above his. On 7 May, the official separation between her and her husband was pronounced. To be presented at court, she required a title. The king purchased the marquisate of Pompadour on 24 June and gave the estate, with title and coat-of-arms, to Jeanne Antoinette, making her a Marquise. On September 14, 1745, Madame de Pompadour made her formal entry before the King, presented by the king's cousin, the Princess de Conti. Determined to make her place at court secure, Pompadour immediately attempted to forge a good relationship with the royal family. After the Queen engaged Pompadour in conversation by enquiring after a mutual acquaintance, Madame de Saissac, Pompadour responded in delight, swearing her respect and loyalty to Marie Leszczyńska. Pompadour quickly mastered the highly mannered court etiquette. However, her mother died on Christmas Day of the same year, and did not live to see her daughter's achievement of becoming the undisputed royal mistress. Through her position as Court Favorite the Marquise, Madame de Pompadour wielded considerable power and influence. Throughout her time as court favorite she was elevated on October 12, 1752 to Duchess, and in 1756 to lady-in-waiting to the queen, the most noble rank possible for a woman at court. Pompadour effectively played the role of prime minister, becoming responsible for appointing advancements, favors, and dismissals, and contributed in domestic and foreign politics. Her importance was such that she was approached in 1755 by Wenzel Anton Graf Kaunitz, a prominent Austrian diplomat, asking her to intervene in the negotiations which led to the Treaty of Versailles. This was the beginning of the Diplomatic Revolution, which saw France allied to her former enemy Austria. Under these changed alliances, the European powers entered the Seven Years' War, which saw France, Austria, and Russia pitted against Britain and Prussia. France suffered a defeat at the hands of the Prussians in the Battle of Rossbach in 1757, and eventually lost her American colonies to the British. 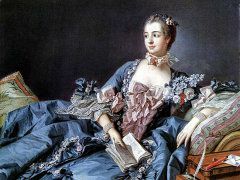 After Rossbach, Madame de Pompadour is alleged to have comforted the king with the now-famous byword: "au reste, après nous, le Déluge" ("Besides, after us, the Deluge"). France emerged from the war diminished and virtually bankrupt. Madame de Pompadour persisted in her support of these policies, and when Cardinal de Bernis failed her, she brought Choiseul into office and supported and guided him in all his great plans: the Pacte de Famille, the suppression of the Jesuits and the Treaty of Paris (1763). Britain's victories in the war had allowed it to surpass France as the leading colonial power — something which was commonly blamed on Pompadour. But Madame de Pompadour supported great ministers like Bertin and Machaut who introduced important fiscal and economic reforms (trade, infrastructure, income taxes) which made France the richest nation in the world. Pompadour protected the Physiocrates school (its leader was Quesnay, her own doctor) which paved the way for Adam Smith's theories. She also defended the Encyclopédie edited by Denis Diderot and Jean le Rond d'Alembert against those, among them the Archbishop of Paris Christophe de Beaumont, who sought to have it suppressed. In Diderot’s first novel, Les bijoux indiscrets (The Indiscreet Jewels), the characters of Mangogul and Mirzoza are allegories of Louis XV and Pompadour respectively. Diderot portrayed Pompadour in a flattering light, most likely to ensure her support for Encyclopedie. Pompadour had a copy of Les bijoux indiscrets in her library, which may explain why the crown did not pursue Diderot for such an indiscretion against the king. The marquise had many enemies among the royal courtiers who felt it a disgrace that the king would thus compromise himself with a commoner. She was very sensitive to the unending libels called poissonnades, analogous to mazarinade against Cardinal Mazarin and a pun on her family name, Poisson, which means "fish" in French. Only with great reluctance did Louis take punitive action against her known enemies, such as Louis François Armand du Plessis, duc de Richelieu. Madame de Pompadour was able to wield such influence at court due to the invaluable role she played as a friend and confidant of the King. In opposition to previous mistresses of Louis XV, Pompadour made herself invaluable to the King by becoming the only person whom Louis trusted and who could be counted on to tell him the truth. Pompadour was an indispensable comfort to Louis who was prone to melancholy and boredom. She alone was able to captivate and amuse him, and would entertain Louis with elegant parties, afternoons of hunting, and journeying between their various real estate holdings. Around 1750 Madame de Pompadour’s role as friend of the King became her solitary role, as she ceased her sexual relationship with the King. The end of this sexual relationship was in part attributed to Pompadour’s poor health, as she suffered the after effects of whooping cough, recurring colds and bronchitis, spitting blood, headaches, three miscarriages to the King, as well as an unconfirmed case of leucorrhoea. In addition Pompadour admitted to having “the misfortune to be of a very cold temperament” and attempts to increase her libido with a diet of truffles, celery and vanilla were unsuccessful. Furthermore, in 1750 the Jubilee year placed pressure upon the King to repent of his sins and renounce his mistress. In order to cement her continuing importance as favourite in the face of these impediments, Pompadour took on the role of "friend of the King" which she announced through artistic patronage. Pompadour’s announcement was most prominently declared through her commission from Jean Baptiste Pigalle, of a sculpture representing herself as Amitié [friendship], offering herself to a now lost pendant sculpture of Louis XV. Pompadour also had a related sculpture depicted in a portrait of herself painted by François Boucher in 1759 (Hyde, 463). Despite misconceptions perpetuated by her contemporaries and much of historical discourse, Pompadour did not supplant her role as mistress by employing replacement lovers for the king. Following the cessation of Pompadour’s sexual relationship with Louis, the King met with young women in a house in Versailles established particularly for that purpose, called the Parc-aux-Cerfs, or Stag Park. It was not, as often described, a harem; it was occupied by only one woman at a time. Pompadour was not involved, other than to accept it as a necessity. Pompadour’s only contribution to the Stag Park was to accept it as a favorable alternative to a rival at court, as she stated: "It is his heart I want! All these little girls with no education will not take it from me. I would not be so calm if I saw some pretty woman of the court or the capital trying to conquer it." 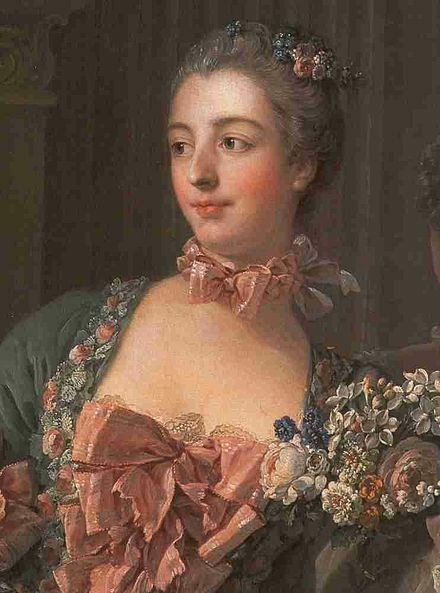 Madame de Pompadour was an influential patron of the arts, who played a central role in making Paris the perceived capital of taste and culture in Europe. She attained this influence through the appointment of her guardian Charles Le Normant de Tournehem, and later her brother, Abel Poisson in the post of Directeur Général des Bâtiments, which controlled government policy and expenditures for the arts. She championed French pride by constructing and later outright buying a porcelain factory at Sèvres in 1759, which became one of the most famous porcelain manufacturers in Europe, and which provided skilled jobs for the region. 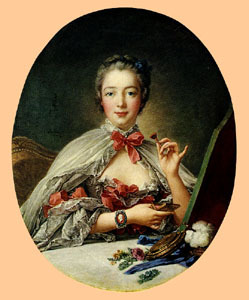 Numerous sculptors and portrait painters were patronized by Pompadour, among them the court artist Jean-Marc Nattier, in the 1750s François Boucher, Jean-Baptiste Réveillon and François-Hubert Drouais. She patronized Jacques Guay, the gemstone engraver, who taught her to engrave in onyx, jasper and other semi-precious stones. Pompadour greatly influenced and stimulated innovation in what is known as the "Rococo" style in the fine and decorative arts: for example, through her patronage of the artists like Boucher and the constant refurnishing of the fifteen residences she held with Louis. Like Pompadour, this style was critiqued by some as a pernicious "feminine" influence, despite the fact that it was embraced by many men as well as women (Hyde, 456-458). However it is also widely recognised that Madame de Pompadour engaged with prominent artists as a way to capture the attention of the king whilst cultivating her public image. The oil sketch of Pompadour's lost portrait sits in the Starhemburg room at Waddesdon Manor, surrounded by Sèvres porcelain, another industry that she greatly influenced and innovated through personal dissemination across an international network of her own clientele. In addition to supporting the arts as a patron, Pompadour also participated in them more directly. Besides being one of the few eighteenth-century practitioners of gem engraving, she was an acclaimed stage actress in plays staged at her private theaters at Versailles and Bellevue (Hyde, 463-4). Melissa Hyde has suggested that some of the artworks made under Pompadour's purview by other hands, notably the 1758 portrait by Boucher of Mme de Pompadour at Her Toilette, can be fruitfully viewed as collaborations with Pompadour. Madame de Pompadour is considered an amateur printmaker who made print engravings with the help of Boucher. She had engraving equipment, to create the prints of works by Boucher and Guay, brought within her personal apartments in Versailles. Her political mind can also be attributed to her great book collection. Madame de Pompadour collected influential books such as the History of the Stuarts, printed in 1760 with her own printing press which can be determined through the stamp markings of her arms located on the cover. Baron Ferdinand de Rothschild, an avid 19th-century collector in London and Waddesdon Manor, collected a number of her books, including this previously mentioned book and a copy of her published catalogue of books from 1764, which lists her entire collection. Madame de Pompadour created 52 engraved prints, of drawings by Boucher, after gemstone engravings by Guay . Her collection of work ,in book form, is called "Suite d'Estampes Gravées Par Madame la Marquise de Pompadour d'Apres les Pierres Gravées de Guay, Graveur du Roy" which translates to in English as "Series of Prints engraved by Madame la Marquise de Pompadour after the engraved stones of Guay, engraver of the King". Some art historians argue whether or not she should be considered a collaborator with the artist's under her patronage, since there is no documentation of how much Pompadour might have contributed to the works; whose idea, and whose composition,will remain a mystery. Louis XV remained devoted to Pompadour until her death from tuberculosis in 1764 at the age of forty-two. Louis nursed her through her illness. Even her enemies admired her courage during the final painful weeks. 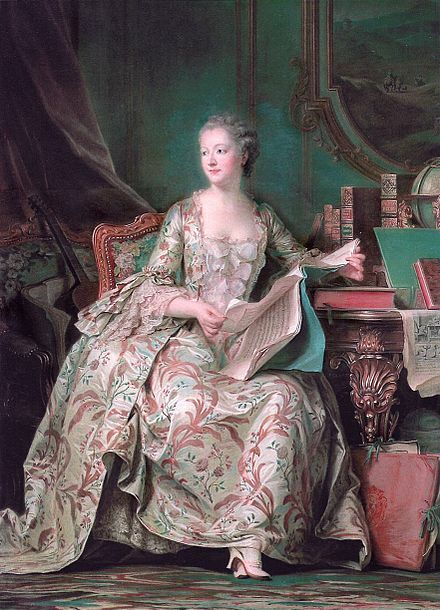 Voltaire wrote: "I am very sad at the death of Madame de Pompadour. I was indebted to her and I mourn her out of gratitude. It seems absurd that while an ancient pen-pusher, hardly able to walk, should still be alive, a beautiful woman, in the midst of a splendid career, should die at the age of forty-two." Many of her enemies were, however, greatly relieved. Looking at the rain during the departure of his mistress' coffin from Versailles, the devastated King reportedly said: "La marquise n'aura pas de beau temps pour son voyage." ("The marquise won't have good weather for her journey.") She was buried at the Couvent des Capucines [fr] in Paris. Sophia Myles (as an adult) and Jessica Atkins (as a child) in "The Girl in the Fireplace", an award-winning episode of the BBC science fiction series Doctor Who, 2006. The 56th (West Essex) Regiment of Foot, a unit of the British Army that existed from 1755 to 1881, was nicknamed "The Pompadours", as the purple facing of the regiment's uniform was allegedly Pompadour's favourite colour. Some soldiers of the regiment preferred to claim that it was the colour of her underwear. Its successor, the Essex Regiment, kept the colour and the nickname. The "coupe de champagne" (French champagne glass) is sometimes claimed to have been modelled on the shape of her breast, although this is probably not the case. Madame Pompadour, a German operetta with music by Leo Fall and book and lyrics by Rudolph Schanzer and Ernst Welisch that also had successful adaptations in London (1923) and Broadway where it opened the Martin Beck Theatre in 1924. She was the subject of several portraits throughout her lifetime. According to legend, the "marquise cut" diamond, also called "navette", was commissioned by Louis XV to resemble the mouth of Madame de Pompadour. The Pompadour hairstyle was named after Madame de Pompadour. In the second act of Piotr I. Tchaikovsky's opera, The Queen of Spades, the role of the Countess recalls the great names of the artists of her past: "and sometimes even the Marquise de Pompadour in person! ".